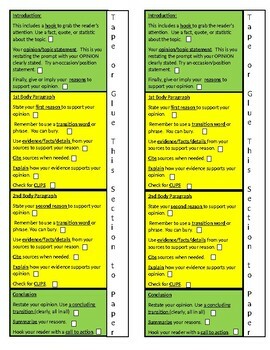 I made these structure strips as a way to help my students become more thoughtful as they wrote a first draft opinion writing. I find that if students can include these elements in their first draft, the revision process can focus less on organization and more on content (word choice, voice, etc.) 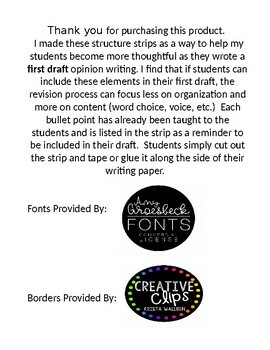 Each bullet point has already been taught to the students and is listed in the strip as a reminder to be included in their draft. 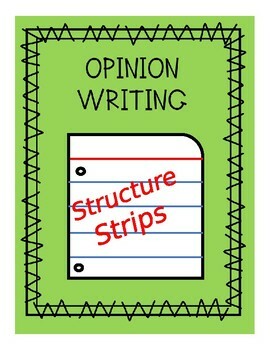 Students simply cut out the strip and tape or glue it along the side of their writing paper.